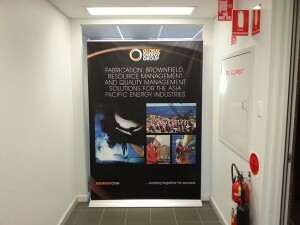 When we print pull up banners, invariably, they’re always the same size – 850mm wide. Because most shopping centres require certain heights and widths, we have most commonly done pull up banner printing at that same width, however we do print pull up banners wider than that. As you can see from the above photo, wide pull up banners are a distinct possibility. And with access to high quality materials, we can ensure your wider pull up banners last the distance. The pull up banner above is actually 1500mm wide, and was used for covering up a doorway while refurbishment was proceeding. This is a far cheaper method than printing a hoarding and because it’s portable it can be used again at any time. We’re sure that if you require wide or oversize pull up banners, then you’ll be happy with our price and service. Head to our contact page to find out more. This entry was posted in Pull Up Banners and tagged Oversize Pull Up Banners, Pull Up Banners Perth, Wide Pull Up Banners Perth by Banners Perth Staff. Bookmark the permalink.